Introducing Boogie Bottoms No-Rub Diaper Rash Spray: No Rub, No Mess! For parents of babies and toddlers, diaper cream is your best friend and worst enemy. It creates a nice barrier to keep tiny bums healthy and free from the dreaded diaper rash while protecting and healing irritated skin. But let’s be real — traditional diaper cream can be a real pain in the you-know-what! That thick white cream that stays put on your little one’s tush isn’t always so easy to wipe off your own skin after applying. Plus, if you’re dealing with skin that’s already red and sore, the last thing you want to do is rub cream on such a sensitive area! But we put up with the mess because it keeps kids healthy, right? Well, say goodbye to the rub and the mess, and meet Boogie Bottoms® no-rub diaper rash spray! 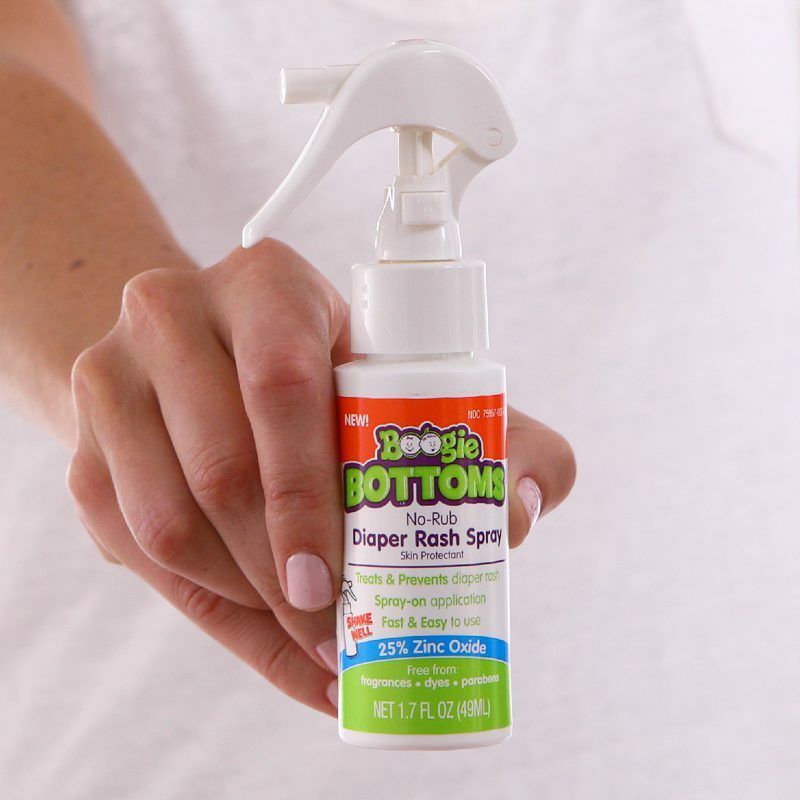 Boogie Bottoms® no-rub diaper rash spray is the mess-free diaper rash cream that you spray! No more getting that messy white cream all over your hands, clothes or that brand new outfit Grandma just bought (it always gets on the nice clothes, right?!). Simply clean baby as usual, then spray Boogie Bottoms® no-rub diaper rash spray in the areas you would normally apply diaper cream. And, if you’re thinking that just because Boogie Bottoms® no-rub diaper rash spray is a spray, that it’s too thin to offer the same protection as the rub-on creams do, think again! You’ll still get that nice, thick moisture barrier you want from a diaper cream without the mess. Plus, your little one still gets the same soothing relief from diaper rash cream without the pain and discomfort they have when applying the regular creams. No touch means no tears! In fact, you can order your first bottle of Boogie Bottoms® no-rub diaper rash spraytoday from Amazon! You and your baby’s bum will be glad you did!